We would LOVE you to contact us! So please give us a call, drop us an email, post us a letter, or send us a carrier pigeon! Jing is beautifully situated in the North Laine of Sunny Brighton’s town centre. This is a very convenient 5-10 minute walk from the train and bus station. 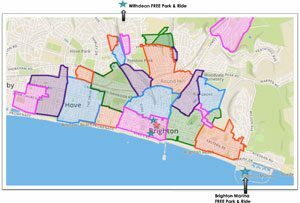 Free parking zones in central Brighton has been changed – for park and ride car parks please see diagram below. Great parking spots can also be found at Just Park!